Famous American actress Angelina Jolie‘s thrilling new film In the Land of Blood and Honey, which she admits has changed her view on acting is her baptism of fire as a director and screenwriter. Angelina Jolie having her baptême du feu directing In the Land of Blood and Honey. “I’ve never felt more exposed. My whole career, I’ve hidden behind other people’s words,” said Angelina and also dismissed the pregnancy and secret wedding rumours. “I’m not pregnant. I’m not adopting at the moment. And no secret wedding,” she said boldly. Jolie is twice married and divorced from actors Jonny Lee Miller and Billy Bob Thornton before settling down with Brad Pitt with whom she has three adopted children, Maddox, Pax, and Zahara, and three biological children, Shiloh, Knox and and Vivienne. In the Land of Blood and Honey is a thrilling love story during the traumatic Bosnian Civil War in the early 1990s and produced in both in English and the Bosnian-Croatian-Serbian language known as BCS. The film is expected to be released on December 23, 2011. 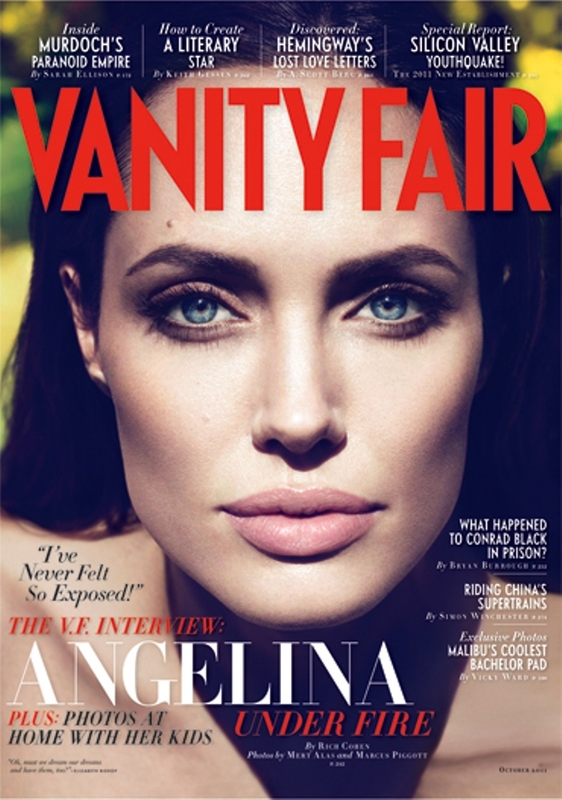 You will read the complete exclusive interview in the October issue of Vanity Fair.